Home/Gift Hampers/Collectible Tins/SALE Teddy Bear Shortbread Tin -5.3 oz. You will love this distinctive smooth-textured matte-finish Teddy Bear tin. 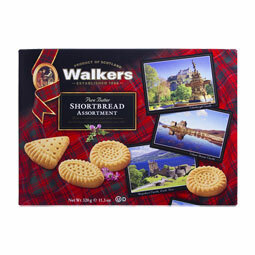 Inside you'll find 5.3 ounces of delicious shortbread from Walkers of Aberlour, that's thirty mini shortbread fingers. Teddy stands 7 inches tall, 6 inches wide at the base and is 4 inches deep. 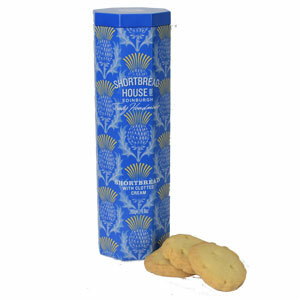 The bear tin is nicely shaped with printed tartan paws, tartan bow and ears. This tin has a smooth textured feel, not the usual shiny metallic surface. A must for any tin collector. What a perfect gift! Sorry, no gift wrap - he's too cute to hide inside a box!